Fan favorite Hot Wheels cars meet some of the greatest pop culture brands ever! This awesome assortment celebrates your favorite licenses and brands with classic vehicles of yesteryear. 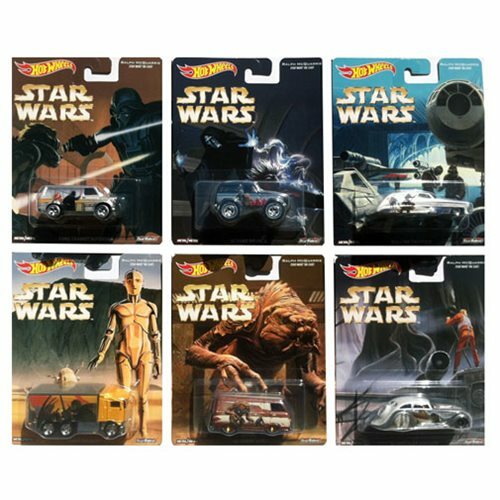 These premium 1:64 scale cars feature the attention to detail that Hot Wheels enthusiasts crave along with some iconic images from Star Wars that decorate some of Hot Wheels' most popular body styles! Each vehicle is in 1:64 scale, with a die-cast metal chassis and Real Riders tires. These Hot Wheels Pop Culture Vehicles are ideal for push-around, display, and creating the coolest collection in town! Not for use with some Hot Wheels sets. Ages 13 and up.